The split squat is a multi-joint exercise that targets several muscle groups across your lower body. Although the split squat itself is a deceptively complex exercise to master, it is a key stepping stone to performing more advanced exercises like the barbell back squat. 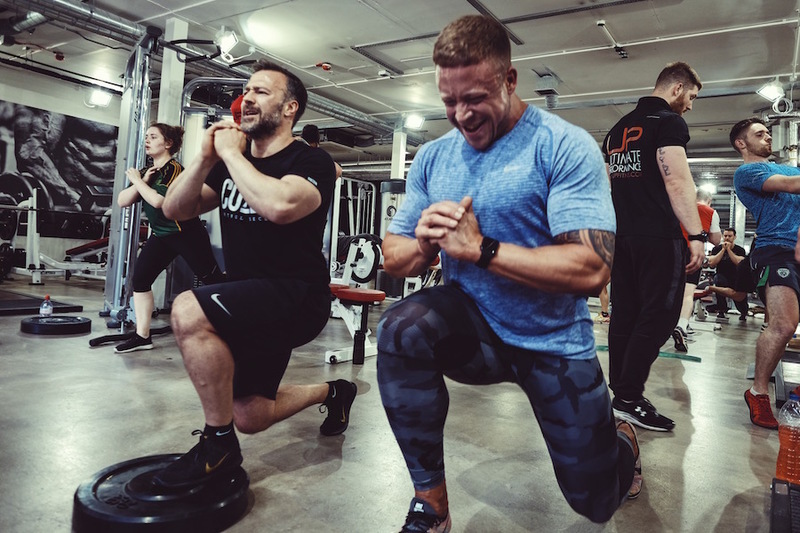 Split squats also require very little equipment (great for when you’re travelling), and there are several variations you can use to mix up your training approach. 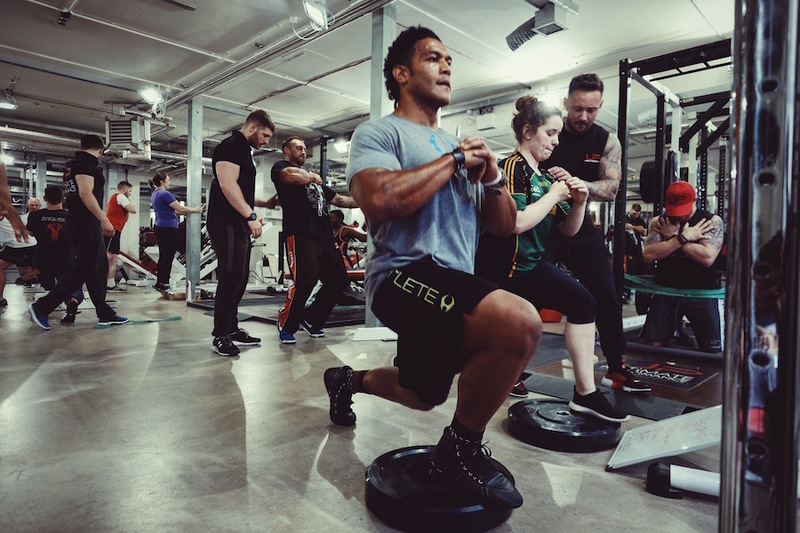 This guide will break down and show you how to perform split squats correctly, and then how to include them in your training programme. Programme design considerations [including exercise variations]. You can perform split squats with just your bodyweight for resistance, or you can use free weights (dumbbell or barbell) to apply extra load. We will discuss starting recommendations and the potential pros and cons of each method later in this article. When using dumbbells, make sure to use weightlifting straps to stop your grip strength from limiting how much weight you can lift and forearm fatigue distracting you during a set. Optional: mirror, weight plate, small block. Performing the exercise in front of a mirror can help with balance. Marking your foot position with a weight plate can help to keep your stride length consistent across all your sets. Placing a small block below your back knee can help to keep your range of motion consistent across all reps. Make sure it’s not too tall to avoid overly limiting your range of motion. 1. Stand in an open space with your feet shoulder-width apart. 2. Place your hands on your hips and tuck your elbows in if you are performing bodyweight split squats. Alternatively, if using dumbbells, let them hang by your sides with your palms facing inwards. 3. Step forwards with your front leg and plant your foot flat on the floor. 4. Raise the heel of your back foot so that only your toes are touching the floor with shoelaces facing down. Both your hips and back heel should be straight. 5. This is the start and finish position for each rep.
Set up note: start with your weaker leg forward first and perform the same number of reps on both sides. Balance is a major limiting factor for most people when performing split squats for the first time. We expect this to a certain extent, and it will become less of an issue as you learn the movement. However, adopting a stance that is too narrow can exacerbate the issue as it means you don’t have a stable base of support. When setting up, make sure to adopt a hip-width stance. A standard performance cue used by many personal trainers is to imagine that you’re standing on train tracks, not a tight-rope. If your stride length is too short, it can force the heel of your front foot to lift in the bottom position. But, if it is too long, you can potentially force your back leg into a compromising position and place unwanted stress on your back. From a standing position, most people can extend their hip (backwards movement of your thigh while keeping everything else still) 10 to 20 degrees. Beyond this point (which is what happens with excessively long stride lengths) any further movement will come from spinal extension (arching your back). With the correct stride length, you will be able to comfortably keep your front foot flat on the floor in the bottom position of the movement, and your back knee will be bent at roughly 90 degrees. This can take some trial and error, and we recommend using the warm-up to find the right stride length for you. Once you’ve found it, mark your foot position with a weight plate so that you can keep your stride length consistent across all your sets. We recommend starting with bodyweight for resistance and only progressing to using free weights (dumbbell or barbell) once you are happy with your technique. As a general guideline, once you can complete three sets of 10 bodyweight reps, you’re ready to progress to free weights. In terms of free weight selection, supporting a barbell across your upper back is less taxing on your grip than holding onto dumbbells. However, it’s also a riskier option, and you could seriously hurt yourself if you lose balance and fall over while holding onto the barbell. If you do want to use a barbell, then make sure you have a training partner to watch over your set or perform them in a squat rack with the adjustable safety pins set to catch the barbell if you fail. In certain situations, e.g. when travelling, you might be limited to bodyweight or hotel free weights that aren’t appropriately challenging. In part two we will cover intensity techniques and programme design changes you can make to overcome this and still get an effective workout. 1.Drop your back knee down towards the floor and push your front knee forwards to close the gap between your hamstrings and calf. 2.In the bottom position, your front foot should be flat and your back knee bent at 90º and one to two inches above the floor. 3.Pause for a moment keeping your upper body braced and tension in your legs. 4.Push through both legs to reverse the motion and return to the start position. 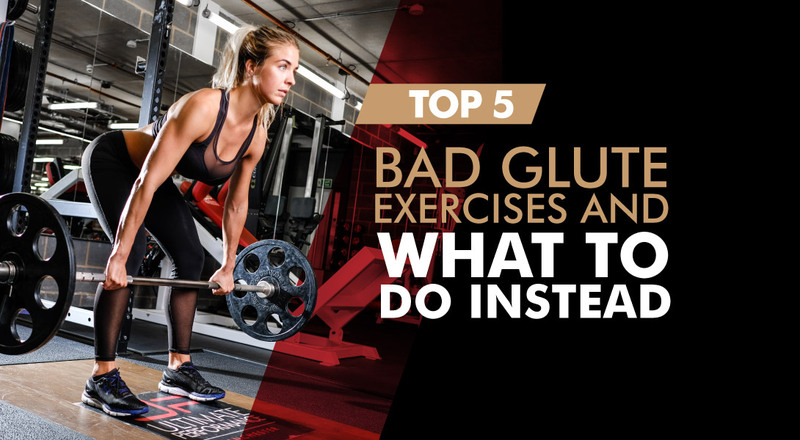 5.Only pause briefly in the top position between reps instead of resting for several seconds. 6.Repeat for the desired number of reps and then switch sides. One of the key things we look for when assessing a client’s set is whether their range of motion stays consistent from the first to the last rep.
As you fatigue towards the end of a challenging set, it can be very tempting to shorten your range of motion and not lower yourself down as far. Placing a small block below your back knee and making contact on each rep gives you a reference point that you can use to keep your range of motion consistent across all reps. Just make sure it’s not too tall to avoid overly limiting your range of motion. On a related note, for some people, especially those with long femurs (thigh bones), the floor can get in the way and stop them from moving through their full range of motion. In part two we’ll cover exercise variations you can use to overcome this. A common misconception is that the split squat is a unilateral (single-leg) exercise in which your front leg does all the work, while your trailing leg rests. In reality, the split squat is a bilateral exercise, which means that both legs are working at the same time. In the video demo, you’ll notice that the trainer’s back knee flexes (bends) on the downwards movement and extends (straightens) on the upwards movement, which is exactly what happens when you perform a seated leg extension. Instead of resting, all the muscles responsible for performing knee extension (your quadriceps) are engaged and working hard. As a result, we recommend taking take 30-60 seconds extra rest when changing sides to let any tiredness in your back leg pass. When performing an exercise, we almost always recommend moving through the maximum range of motion that your joints allow for to develop strength throughout the entire range. However, for some people, especially those with long femurs (thigh bones), the floor can get in the way and prematurely cut their movement short. A simple solution is to elevate one (front or back) or both of your feet using a raised platform roughly three to four inches above ankle height. Although the goal of all three variations is to increase your range of motion, which option you choose will determine if this increase affects your front or back leg. Elevating your front foot allows you to move through a greater range of motion with your front leg and increases the challenge to the muscles involved (quadriceps, adductors and glutes). Elevating your rear foot allows you to move through a greater range of motion with your back leg and increases the challenge to the muscles involved (quadriceps). Elevating both of your feet combines the extra challenges provided by the front, and rear foot elevated variations. A common mistake when performing the feet elevated variations of the split squat is not using the extra range of motion made possible by the raised platform. Your back knee should drop lower than on the flat foot version, but only if you can comfortably get into this position. If you can’t, then stick to the flat foot version. When you first start split squatting, we recommend sticking to the 6-12 rep range as this provides more practice time per set than lower rep ranges. Moreover, if your goal is to build muscle, then you are looking for the most efficient way to accumulate training volume (total amount of weight lifted), which is typically most straightforward to do in the 6-12 rep range. We very rarely prescribe sets of less than six reps for the split squat due to practical issues associated with getting heavy weights into position and holding onto them throughout your set. The split squat is a deceptively complex exercise that involves lifting your full bodyweight, balancing on your front foot and tiptoes of your back foot, and coordinating the movement of multiple joints at the same time. As a result, we recommend performing it toward the start of your workout when you will have more energy and perform better. 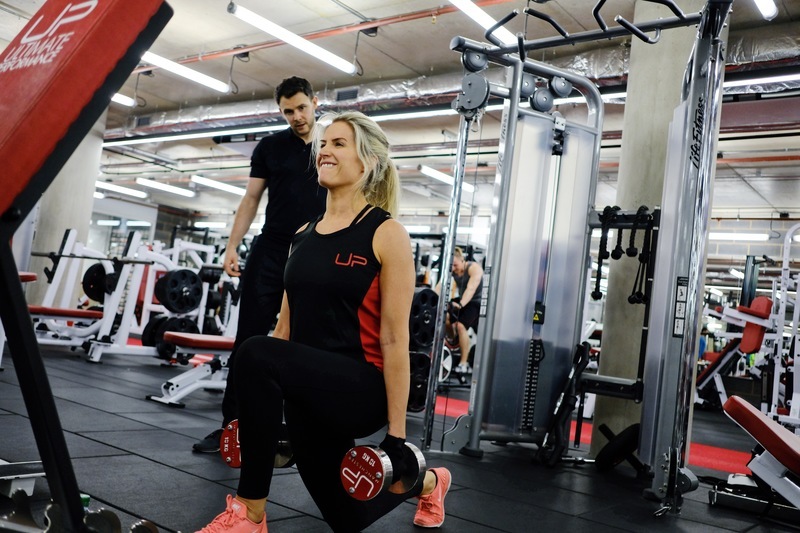 To minimise any impact on your performance we recommend pairing the split squat with a leg curl, hip extension exercise or upper body pressing movement, such as the dumbbell bench press. 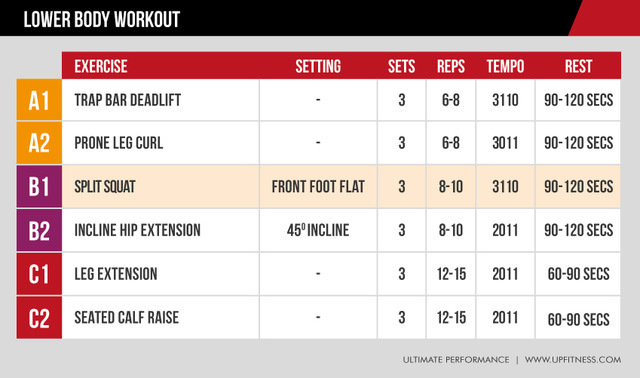 If performing paired sets, rest for 60-120 seconds between sets of each exercise. Alternatively, if performing straight sets (consecutive sets of the same exercise), rest for 120-180 seconds between sets. And, whichever option you choose, take an extra 30 seconds rest when switching legs. The downward movement (eccentric phase) should take between two to three seconds, and the upward movement (concentric phase) should take one to two seconds depending on how heavy the weight is and how fatigued your muscles are. Make sure to pause in the bottom position rather than bouncing out of the ‘hole’. Including extended pauses here (one to two seconds) is a great teaching tool that encourages you to lower yourself under control, maintain a consistent range of motion and to start the next rep by engaging the right muscles. Only pause briefly in the top position. Any longer and you’re resting! 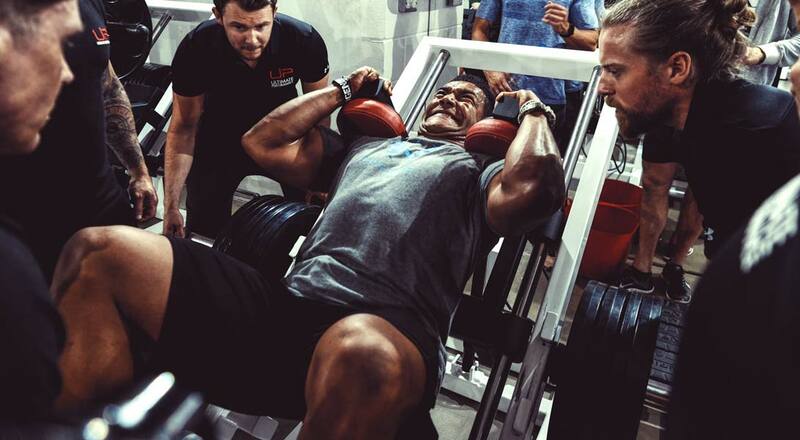 Intensity techniques are programme design tactics that we use to push clients and their muscles to the limit, typically on the final set of an exercise. On your last rep, lower yourself into the bottom position, pause briefly, and then press through your legs to begin the upward movement but stop one to two inches above the bottom position. Once in position, keep your upper body braced, tension in your legs and challenge yourself to see how long you can hold it for (aim for 10-30 seconds). Select a weight that you think will push you close to failure on your final set and aim to perform the same number of reps as you did on your previous sets. 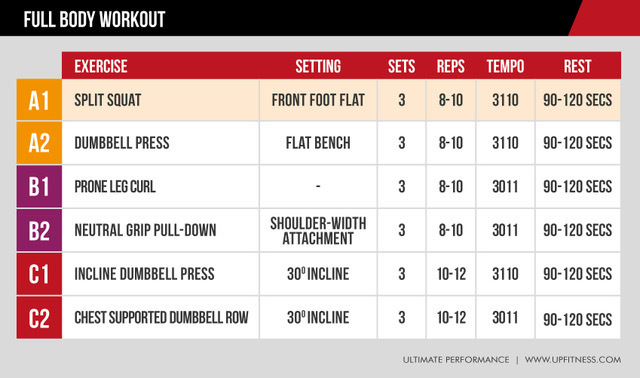 Following this, drop the weight by 10-30% and immediately perform another set to failure. ... Now take a big break and repeat on your other leg! Now that we’ve covered proper technique and the most important programme design considerations, the next step is to pull all this information into example workouts you can test out as part of your training routine.